Join Mad Swirl & Swirve the 1st Wednesday of Marchy (aka 03.02.16) as we continue to swirl up our open mic madness at our NEW Open Mic home, The Underpass Bar! This month we feature Poet Quinten Collier all the way from the Rocky Mountain HIGH state of Colorado. 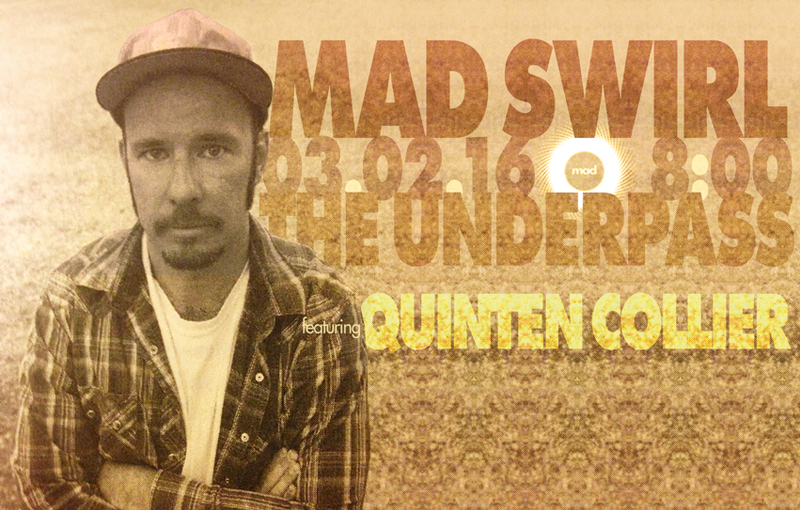 A Contributing Poet to Mad Swirl since 2010, Quinten is also a rising lyricist on the Nashville scene. See him read from his new collection Chem Trails, as well as some of his newer works this next first-Wednesday. P.S. Mad Swirl will once again be trying our hand at the whole UStream broadcast so those that can’t be here in Big D to witness our mic madness live can still get a look-see at the swirlin’ action. Tune in THIS 1st Wednesday starting at 8-ish!